NUPENG Drivers Suspend industrial action – Royal Times of Nigeria. The NUPENG President, Igwe Achese, made the announcement after an extensive meeting between the group and the Nigerian National Petroleum Corporation on Monday in Abuja. At the meeting, the Group Managing Director of NNPC, Maikanti Baru, announced that the Minister of State for Petroleum Resources, Dr. Ibe Kachikwu, has approved an increase of tanker drivers’ bridging allowance from 6.20 Naira to 7.20 Naira. 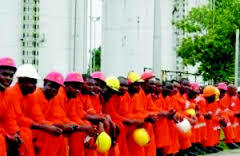 The tanker drivers had commenced an industrial action earlier on Monday to press home their demand for improved welfare. Mr Achese, who announced over the weekend that members of the union would withdraw their services, raised concerns that Nigerians may experience another round of fuel supply crisis. He noted that the grouse of the drivers are poor working conditions and welfare package among others. The NUPENG President said the Federal Government has ignored several appeals by the union to help improve the welfare of the drivers.